I'm here again for my last bit of the trip. After travelling to almost the whole part of the East Coast, we were ready to head back where we started, Ithaca to start packing up for our flight home. But before that we had a lil sight seeing in Ithaca cause we didn't get the chance to do it the last 2 weeks. 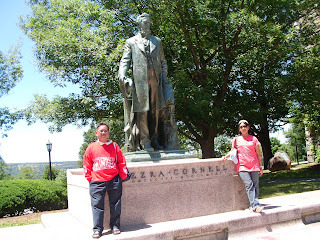 We did some last minute shopping in Waterloo Premier Outlet and also visited another university, Cornell University. We had dinner at my mum's Fulbright host house, Dr. Andrew, a lecturer in Cornell. 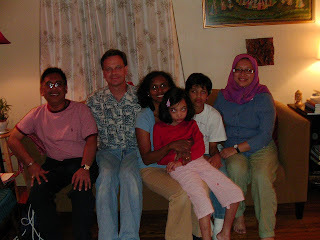 He married a Malaysian and the wife cooked fish curry and rice and apple pie and ate it with ice cream. Yum! After dinner we had to go back to the motel and started packing up. We had 6 luggages that had to be checked in plus another 6 carry-ons. Imagine what our trolley bags looked like. So then I had to be on the 36 hours plane ride.....again! I'd had enough of plane rides for awhile now. In fact, I'd enough of all means of transportations. Planes, buses, trains, taxis even trishaws! They had trishaws in NYC. I been on all those transports for far too long during my trip that my whole body are so sored by now. 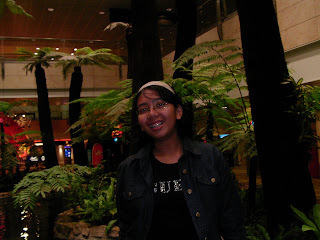 So now it was time to get back to reality back home in home sweet home, Malaysia and focus on studies and PMR. Oh god, PMR. My knees shaked just by typing the name.